Looking for the Best 12 Person Tent? What you should consider when buying. The winner of the best 12-person tent roundup is the Ozark Trail 16×16 Feet 12-Person 3 Room Instant Cabin. 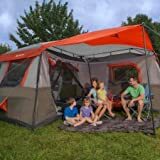 Requiring no assembly, this is an easy tent to set up thanks to the pre-attached poles that only need to be unfolded and extended. It has a center of six feet giving you plenty of room to stand up, plus you get several windows and room dividers to create three separate rooms. Easily fitting twelve people or three queen air beds, you also get an oversized ground vent that fits an A/C unit to make your camping experience more comfortable. All the seams are fully seamed, and the large front door allows for easy access. The definite winner of the best 12 man tent roundup is the Ozark Trail 16×16 Feet 12-Person 3 Room Instant Cabin hands down. Having one large tent can be very convenient If you like to camp with a large group of friends or have a large family. Not only can it save money on tents and camping site fees, but it can also just be easier to set up one too for everyone to sleep in. 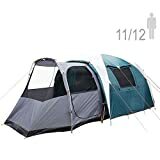 Here are a few tips on what to look for in the best 12 person tents for camping and a few reviews to help you start shopping. The most significant benefit of a 12-person cabin tent is all the sleeping space. Although you could pack up a bunch of smaller tents, having one large tent helps to keep everyone together. Which is an excellent advantage if you have kids, so they are close by at night. This size also means you have less to pack since its only one tent instead of several tents. Set up is even simpler and you won’t have to worry about where you are going to set up multiple tents at your campsite. Interested in pop up shade canopies for those sunny days? Best family tents for bad weather when you don't trust the meteorologist. Lost or want to replace your camping stakes? Consider a portable fan for camping this summer, to help stay cool. As you will quickly find, not all tents are right for everyone. Each tent has its advantages and disadvantages, and it is a good idea to do your research to find the right tent for your needs. A vital feature of a tent that you want to hold twelve people in is, of course, its size. You want something roomy with a lot of floor space so you can all sleep comfortably. It is easy to calculate the dimensions of the tent to determine how much space each person needs to make sure that the tent will provide enough space. And for those tall individuals, you want to make sure you have peak height inside the tent so you won’t spend the entire time hunched over as you walk around. Rain is always a possibility no matter what time of year. Make sure that the tent you are considering is completely waterproof so that every inch of floor space stays dry. Also, if you camp throughout the year, make sure to find a four-season tent that will be thicker and more durable. You can tell a tent is waterproof in a few ways. First, check the tent fabric rating. The widely accepted minimum standard rating for “waterproof” is 1500mm which means that for one minute, a high flow of water can be held against the fabric before it seeps through. This rating is only really good for light showers. The higher the mm rating, the more waterproof the tent is, with fabrics at the upper end of the scale in the 10,000-40,000mm range. These should be able to withstand some pretty intense downpours. You may notice that the fabrics used for tent floors and footprints tend to have a higher rating than the tents walls/rainfly. This is due 1) the floor potentially being in constant contact with a wet surface, i.e. the ground and 2) the pressure exerted by your bodyweight, or the weight of your gear pushing the fabric into the wet surface - imagine pushing a piece of kitchen down onto a spill versus just gently laying it on the surface. The former is more quickly going to absorb the water. You also want to look for seams that are taped. This means that a transparent tape was applied using heat that covers all stitches and attachment points that are sewn into the fabric. Lastly, look at the zippers, windows, and doors, a good tent will have some form of a flap or covering to ensure these weak points don't become "leak points. Some tents will have skirts or flaps that extend out from the tent’s side that help direct water away from the tent. You want to look for a lightweight tent that two people can easily carry and set up. A 12-person tent is generally between thirty and fifty pounds. Remember that the packed weight is the weight of all the parts of your tent including poles, rainfly, and tent body. The packed size refers to the space that the tent takes up in your pack and can also tell you how easy it is to carry your tent. If you are camping in a group, it is always a good idea to split up all the different parts to spread out the weight with your friends. These tents can also have folded parts that are difficult to maneuver so do some research to find one that is easy to unfold and fold back up again. Remember that the mix of an awkward design, heavyweight, and large size can create an unpleasant experience when you reach your campground. When searching for the best 12-person tent, look for polyester or nylon tents that are good for moderate weather and will last several seasons. 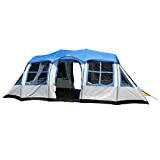 Typically, you will find air vents and mesh windows in these tents for warmer weather and rain that can also be sealed with zippers and toggles to keep out insects. Where you will be using your tent is also an important consideration, especially if you will be camping in extreme weather. It is essential to choose the right type of tent not only for the season but also the location you will be camping in. The construction and type of tent you buy should be rated for the season or whether you plan to camp in just in case you get strong gusts of wind and rain. You will also want to check weather reports to make sure you won’t be experiencing weather that leaves you stuck for a while. Remember, that the number of poles that are used can help create more stability in case of strong winds. Other considerations for where you place your tent will include the terrain. If you use your tent on the beach a lot, you want to make sure it can withstand the strong winds that are often experienced there. Always check on the type of materials used is well suited for the area that you place your tent. For those that only use their tent once a year, you don't have as much to worry about. For those that use more frequently or for at least a year, you want to do a little more research into what type of tent will suit you. Frequent campers will probably want to invest in a tent made of high-quality materials that will have the longest lifespan. Keep in mind that any tent will wear after a lot of use, but those with better construction and made with durable materials will last you the longest. Comfortable and easy to set up, the Tahoe Gear Prescott 12 Person Tent is perfect for any outing or camping trip. With a center height of six feet six inches, the Prescott allows you to walk and move around in the tent easily. It includes fiberglass poles that make setting up a breeze and also comes with ropes to secure the tent in case of wind. Weighing only 31 pounds, the Prescott has a simple and practical design that creates the perfect place for your family to rest at night or to spend time together during the day. This is a budget-friendly tent that has high-quality features that make it worth the money. The Prescott is an excellent choice for a family that wants a larger tent but doesn’t want to spend hundreds of dollars. Other features of the Prescott include a full-mesh roof for those that love to stargaze and a tall enough roof that can accommodate taller individuals. Assembly is also easy with shock-corded fiberglass poles and taped fly seams ensure that insects stay outside. 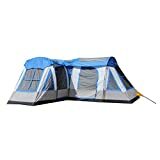 This tent is excellent for a large group of friends or a family that want to camp on a budget. With a center height of seven feet, you can easily walk around the Tahoe Gear Gateway 12-person Tent. This durable tent comes with water resistant features and works well in either warm or cool weather. Lightweight enough to carry, this is a very comfortable tent for a family and includes a solar shield to keep away the sunlight. The Tahoe Gear comes with ropes that keep the tent secure in the wind. Set up in an L-shape, this is an excellent design for families or friends to use for either nighttime or daytime use. It includes two large D-shaped doors at opposite ends of the tent so you can leave the tent without walking over everyone. The dome shape of the tent gives you plenty of headroom, and the full mesh roof allows you to stargaze as you fall asleep. Made of polyester, the Tahoe Gear comes with a partial fly for the roof in case of rain to make sure you are completely protected. This product is excellent for any weather and is a great family tent. With no assembly required, you can set up the Ozark Trail 12 Person Instant Cabin Tent in just under two minutes as the poles are pre-attached to the tent, so all you need to is unfold them and extend. With a center height of six feet, there is room to stand up. This spacious tent features windows on every side, three separate rooms in a cabin style design, plus a large front awning so you can relax in the shade. You can comfortably fit twelve people, and three queen air beds and the two internal room dividers let you create separate living and sleeping areas. There is also an oversized ground vent allows you to fit an air conditioner for added comfort and it also includes a power outlet that you can plug into the tent. All seven windows are easy to clean, and the seams are fully seamed, and the large front door allows for easy access. This product is excellent for families with its rooms and easy assembly. With a spacious interior, the Alpha Camp 12 Person Tent can comfortably accommodate up to twelve people and three queen air beds. With a large D style door and five windows, you won’t have to worry about ventilation, and the mesh windows give you excellent protection against mosquitoes and other insects. It is a 12 person tent with screen porch that is a great way to lounge in the great outdoors away from the bugs, plus you get a large front awning that protects you from the sun and elements. The Alpha Camp Tent also comes with two large side pockets to store valuables and a room divider to give you privacy. Featuring a center height of eighty inches, the large tent can accommodate taller individuals without a problem. Other features include tent stakes, reflective tent ropes, tent poles, rainfly, and a carrying bag with wheels. This tent is best for occasional use when you don’t have that far to travel to your campsite. Very spacious and fully waterproofed, the NTK Super Arizona 12 Person Tent is an excellently sized tent for up to twelve people. This breathable tent is constructed of anti-fungus polyethylene that includes a silver-coated layer, and the inner tent is shielded in such a way that it offers you more ventilation. Easy to set up, this durable tent weighs 42 pounds and protects you from mosquitoes and other insects. The NTK Super Arizona is very comfortable and easy to set up. It has an interior height of 6.9 feet and is partially made of polyurethane and aluminum that protects you from the heat. Other features include a carrying bag, three windows, two doorways, and a detachable room divider. This product is best for taller individuals and groups that want separated space from a room divider. Looking for a Smaller Tent?